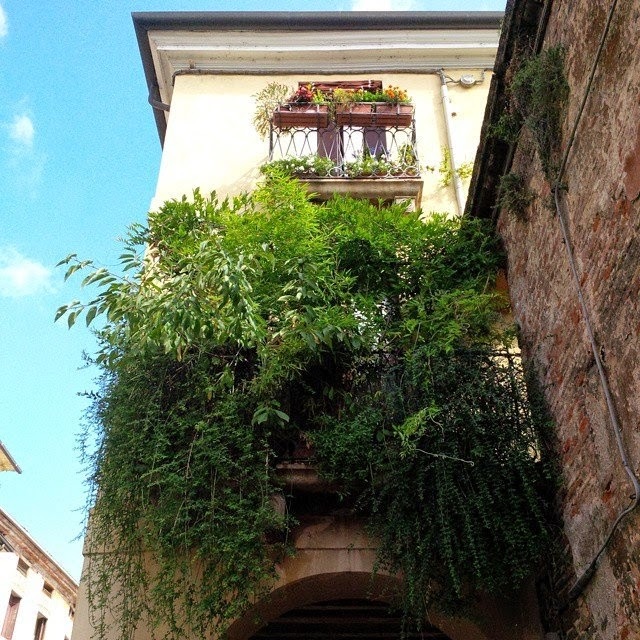 Today I want to tell you about one of my most favourite things in Vicenza: the hanging gardens. 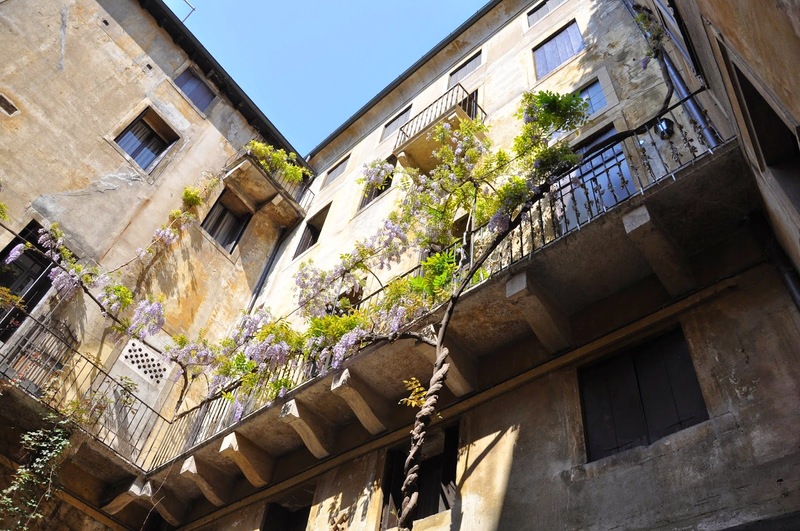 All around town colourful blooms and abundant green leaves hang with wild abandon from windows, cascade down from rusty balconies and spill over medieval walls. 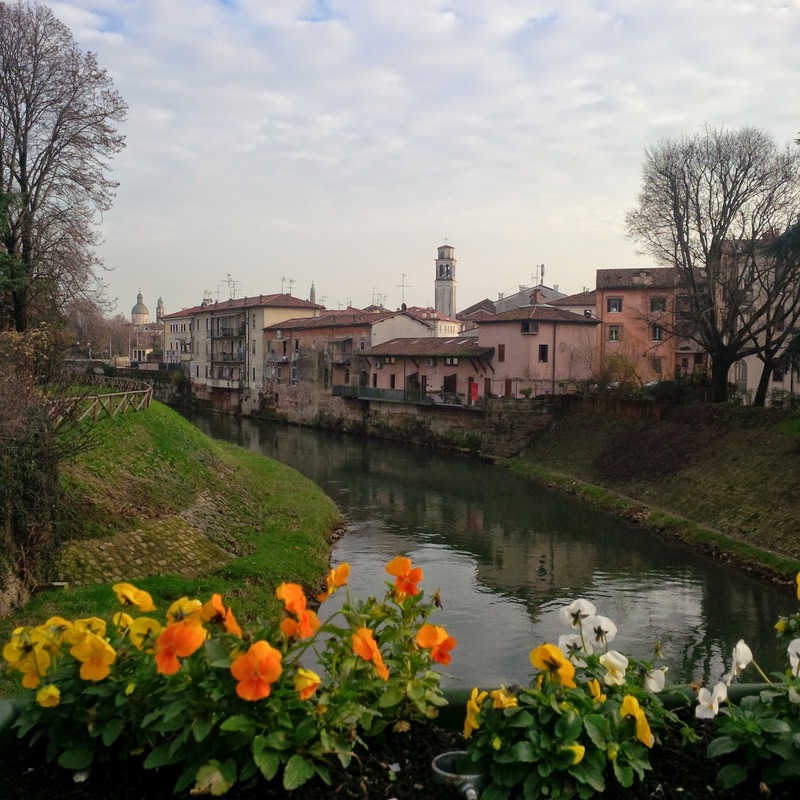 Even the bridges above Vicenza’s two rivers are adorned. 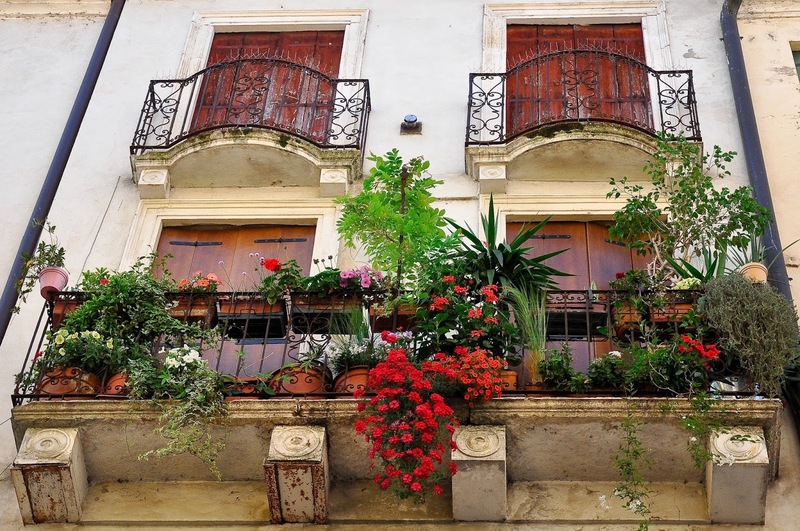 It is like Babylon’s mythical Hanging Gardens have been re-thought in smaller balcony-sized formats and spread all over town for people to enjoy. 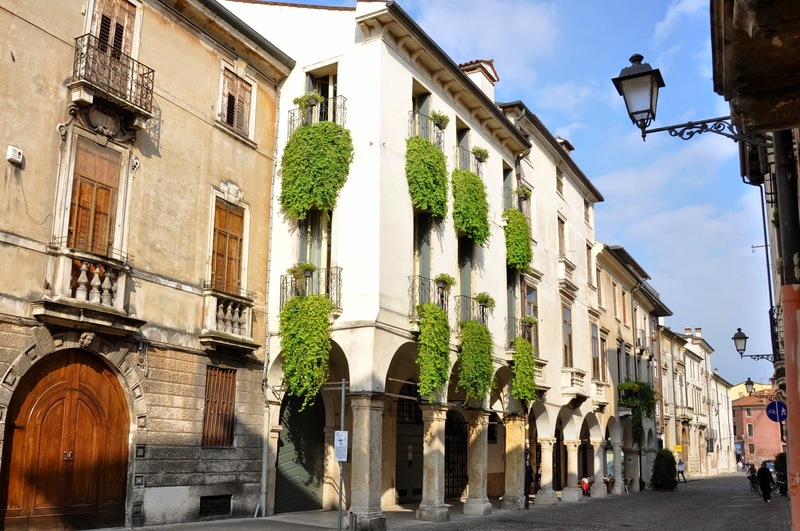 I remember my very first day in Vicenza last August. 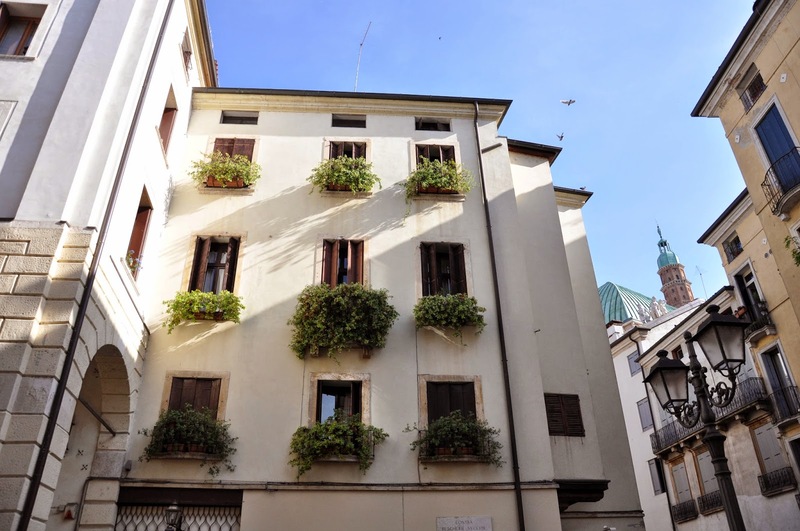 We were walking up Corso Fogazzaro – one of the city’s main streets – and my eyes were immediately drawn to the beautiful green displays hanging above our heads. I admired the artistry and the aesthetics of people who have invested their soul in creating window displays such as this one. 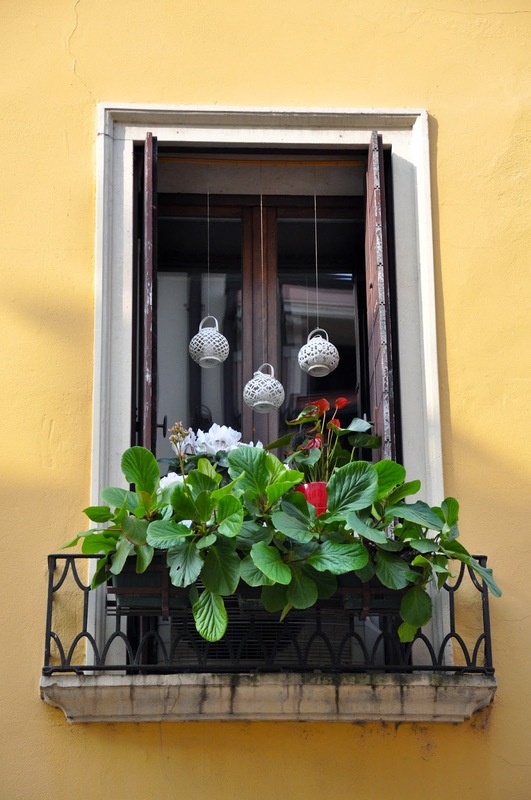 It was like they were welcoming me to Vicenza by showing me how beautiful life can be here, where people don’t hide behind their curtains to spy on what is happening on the street, but instead throw their shutters open and use plants and props to create a pleasing scene to greet anyone who passes by. Such green-fingered displays are all over town. 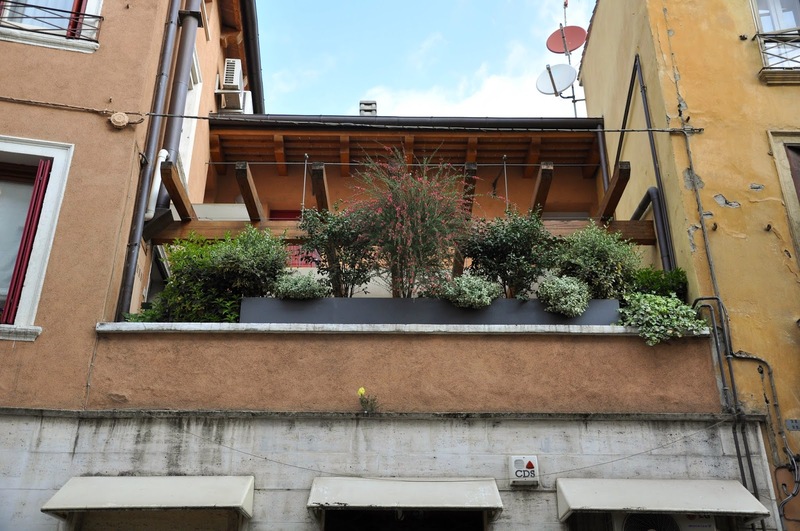 It is amazing how the smallest and most awkward of spaces can be turned into a veritable layered garden. 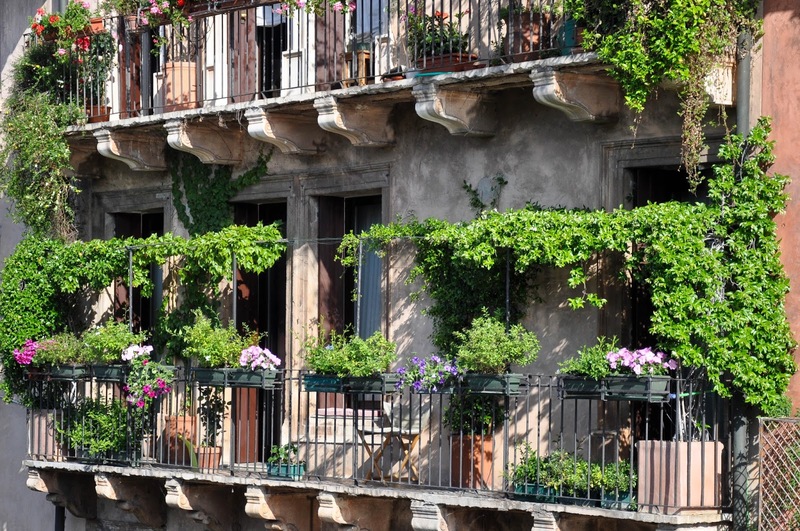 It must be gorgeous to sit on one of these balconies and observe the world go by your private hanging garden. 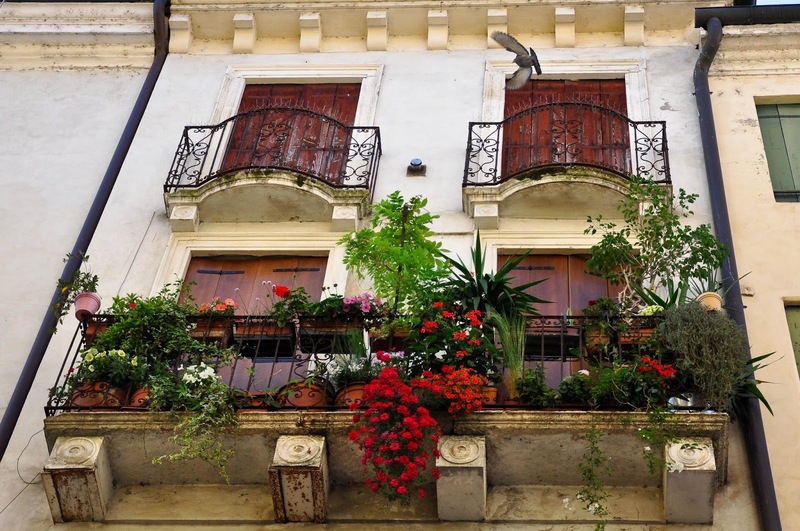 It is not just the windowsills and the small balconies that get adorned. 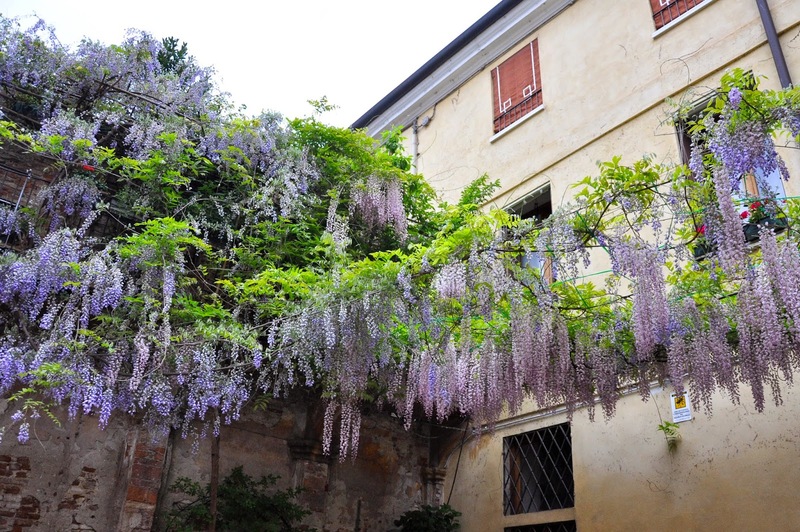 Walk into any courtyard in Vicenza and you will see flowering trees reaching up to large verandas and covering them with their blooms. Wisterias are especially popular and when they are in full bloom they are spellbinding with their purple blooms and enchanting fragrance. 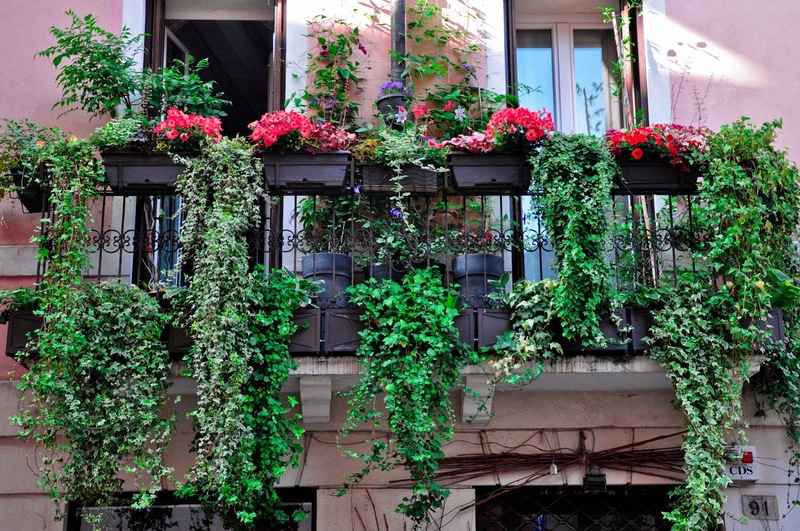 Once their flowering season ends, their lush foliage turns balconies into veritable urban jungles providing a welcoming shade in the long line of hot sunny days which starts in May and goes on uninterrupted at least until October. Green adds such vitality to the old houses around town. It emphasises their worn out by the weather and the human hand facades. 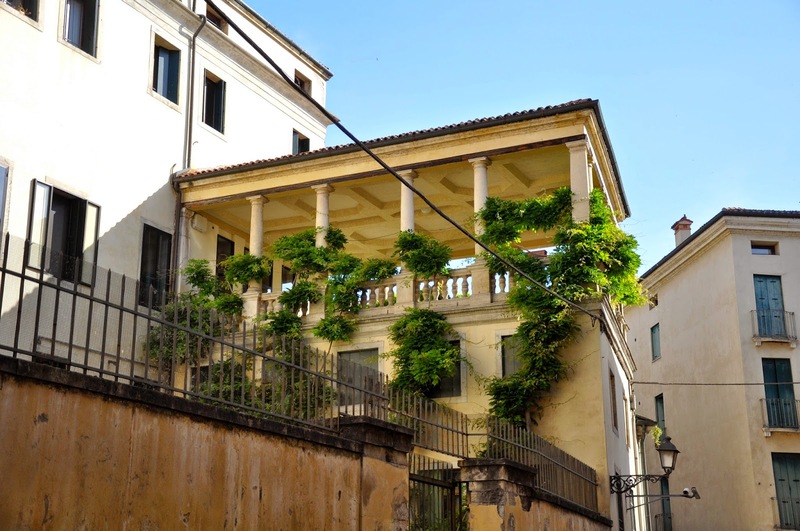 If you look up you will also notice the gorgeous roof gardens where trees and bushes stretch their branches out to the blue Italian sky. Every available space seems to have been utilised no matter how small or how quirkily sandwiched between two buildings. 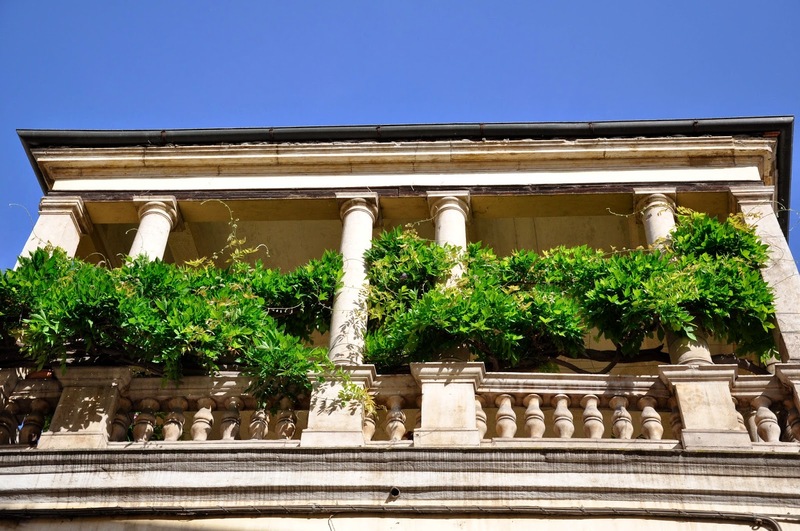 To finish with, let me show you an amazing loggia which is straight out of a fairytale. I found it by chance, as I was exploring Vicenza’s historical centre. 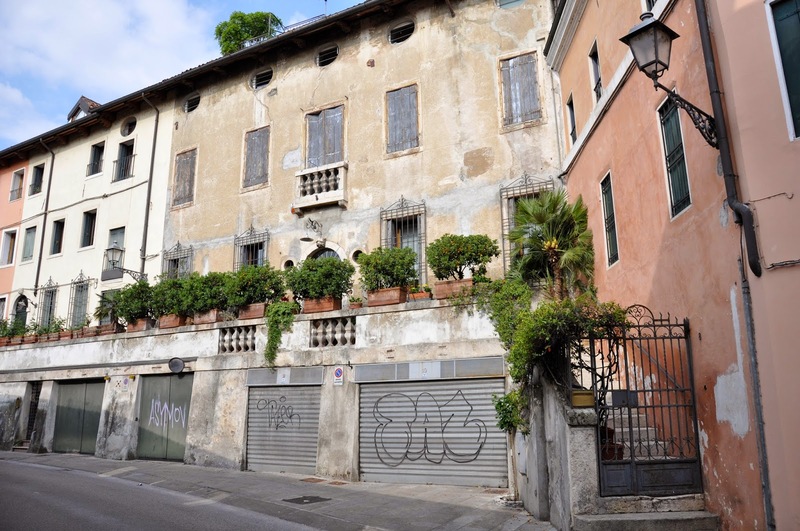 In a city where every other building is a sumptuous palazzo you may soon become immune to gorgeous architecture, but little discoveries like this one make you see the world with fresh eyes again. Just imagine the balls one could have in this dreamy space. This is all for today. 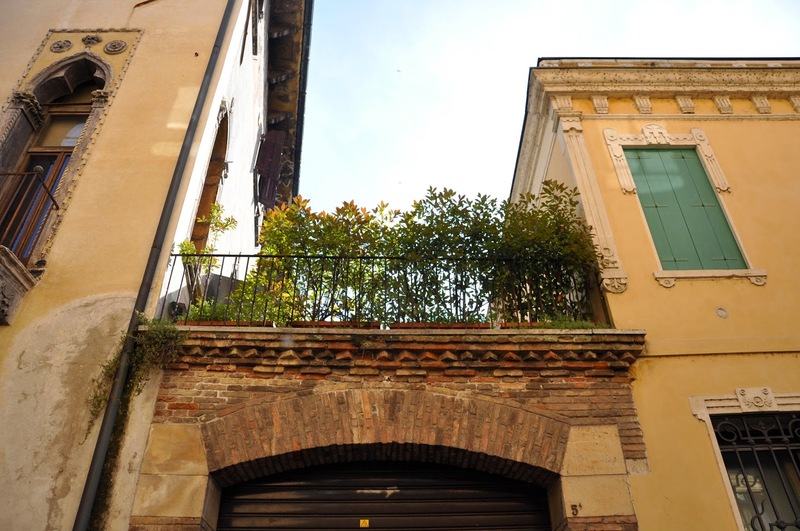 I hope you loved this little exploration of the hanging gardens of Vicenza. Let me know what you think.